My neighbor is collecting all the seed pods from his laburnum tree and plans to have a big bonfire with them next week. Will this be a health hazard? I don't see any data on whether people have been injured by burning laburnum wood, but breathing the smoke could potentially be a health hazard. 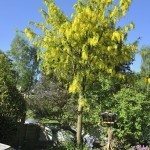 The toxin in laburnum is cytisine, a chemical relative of nicotine, so it could probably be inhaled in the smoke when the parts of the plant are burned, like nicotine can.